I *meant* to take a picture of that tiramisu in it’s untouched entirety, but ‘accidentally’ dropped my spoon into it and found that the spoon had mysteriously made it’s way to my lips before I got a chance. And, yes, I realize that I am starting this entry with the final course, but I can’t stop thinking about it. Luckily for me, I have half of it left…waiting to be eaten by me at 3am or maybe for breakfast. I should NOT eat tiramisu after a late dinner. It will keep me up all night. I knew that, but ordered it anyway when I saw it on the next table over, being adored. The ratio of cream to cocoa to Marsala (yes, Marsala!) soaked biscotti was divine. Each layer was distinct and delightful. 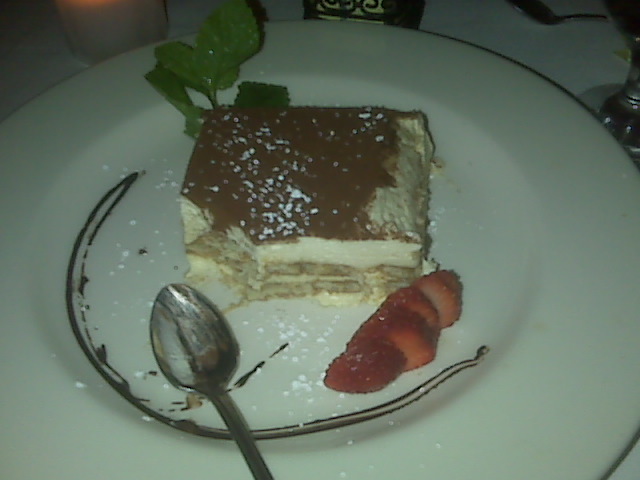 Dare I say, the best tiramisu I’ve ever had. 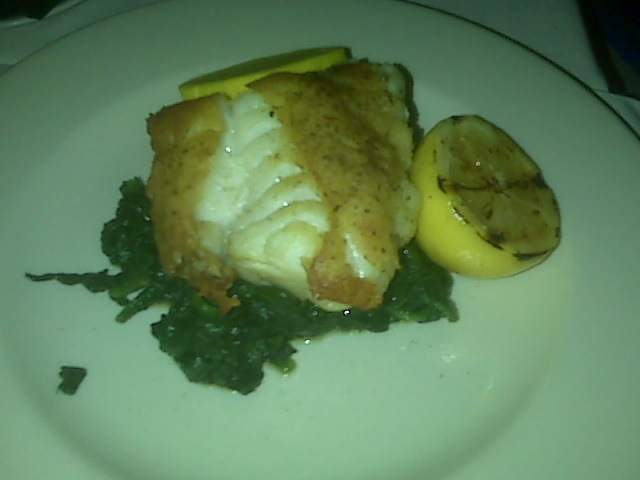 Progressing in reverse order, my friend ordered the special of Chilean sea bass with garlic spinach. 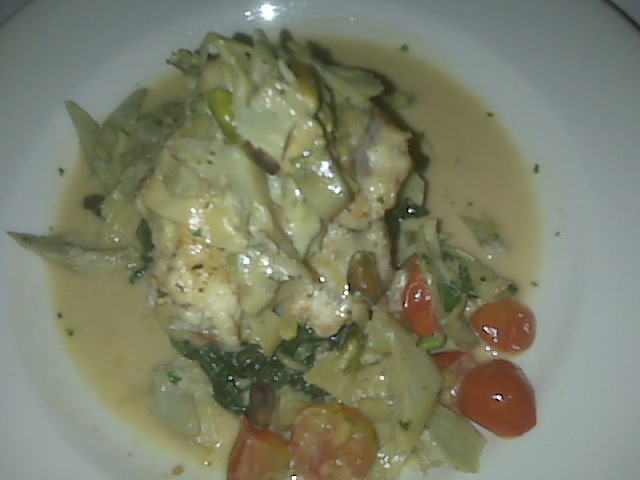 This might have been the most perfectly cooked sea bass I’ve ever had. SO crispy on the outside, delicately seasoned, rich and flavorful. This is how fish should be prepared. The owners of the restaurant from my previous entry would be smart to come try this and learn from it. I ordered the monk fish with artichokes. Again, cooked to absolute perfection with a sauce that did not compete with or overpower the fish- just complimented it in a lemony/winey/delectable way. The only thing I didn’t love about my dish was the addition of pistachios. I felt that they were clashing with the delicate flavors a little. Personally I just don’t love nuts with fish I guess. I will give the chef props for creativity though, that was definitely original, and it was easy for me to avoid them. Not pictured are the 2 AMAZING appetizers we shared. Too bad too, because they were both beautiful…but silly me forgot to turn my camera flash on. Sorry about that! One was a tuna tartare with avocado, lemon, ginger and cucumbers that was so beautifully presented it was a little sad to break into it. The other was the most UNREAL cheese, a homemade stracciatella with prosciutto, tomatoes, basil and eggplant. The eggplant was so naked and wonderful, just a slight flavor of vinegar. I’d never had eggplant prepared this way, where there was no breading to muddy up the texture or flavor. I liked it so much that I asked our fantastic waiter to explain how it was prepared. Little did I know that he was also a serious foodie and very knowledgeable chef himself and he got a little excited and animated as he explained. Of course, once we found that out, we thoroughly enjoyed our chats with him between courses. He was sweet and sincere and completely understood that a good dining experience has a lot more to do with what’s on the plates that the chef sends out. A truly wonderful experience includes a waiter who knows what he is talking about and does it with a personal flair, knows when to check on us and when to let us talk to each other, and appreciates our love for good food and good friendship. A special thanks as well to Luca, the kind manager who helped to make our meal an especially memorable one. As I reflect on on the whole evening, starting with the very difficult decision of choosing dishes from an incredibly appealing menu, I am certain that I will be back soon.